The award-presenting ceremony of the Mashup Awards 6[J], an annual web service development contest organized by a bunch of Japanese web companies, took place in Tokyo yesterday, where the venue was packed with hundreds of presenters and an audience. This contest literally aims at letting participants compete their skills in developing a web service by using public third-party APIs selected by the contest organizer. 222 APIs were allowed to be used to develop a mash-up service, and 544 web services have been submitted for the contest during the two months of the application period. Let’s see some of excellent services that have won awards. Emiri System was originally developed by Tetsuro Ueda a.k.a. Emiri Papa for recording the growth of his daughter Emiri. It became a social network for sharing updates among nursing parents about their child-care, children’s growth and development. It has engaged 3,300 users from 23 countries, stored 1.33million-day dairy updates, 3.7 million pictures and 60,000 videos. In order to enhance the convenience and allow the users to enjoy the experience anywhere at anytime, he has integrated it with many web services. Get-Relief Rader is a location-based iPhone app developed by Tokyo-based tech-startup Kayac (related Asiajin stories). By Establishing a pair with someone else using the app (via Bluetooth), a user can find where the other of the pair is located very roughly without launching the app (running on background). Using the app between a couple may contribute to affair proof their marriage. Tag Tansu is a closet that allows you to upload pictures of your clothing only by hanging a piece on a hook and sort it out. It’s invented by tsuka_pan & sgss who has won the juries’ special prize with Cast Oven at the previous event. An RFID tag embedded on the neck of the hanger tells the sensor what kind of clothing and the pictures will be tagged with the category automatically. By integrating with a social network, you will be allowed to ask your friends about which clothing you wear, and it prevents you from buying something similar designed to what you have because you can check your collection with your cellphone at boutiques. Teritori, which is named after territory, is a social game in which the aim is to occupy the other’s home base by using location profiles. It is a web app and can be used on the iPhone and the Android 2.x handsets. You can found VIRTUALLY your own lands on the game at your REAL favorite spots, and fight against the others by spy infiltration and reconnaissance activities. Twiccha, named after Twitter and chat, is a web service literally that allows you chat with someone only with your Twitter account. 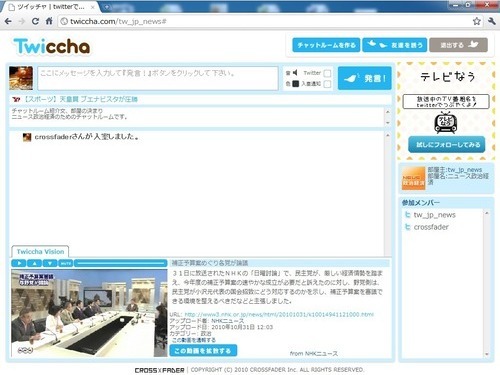 You can keep chatting while watching NHK’s news clips[J] and satellite broadcaster BS Japan’s TV show “Deki-Biji[J]” and reading Yahoo Japan news in the chat room. 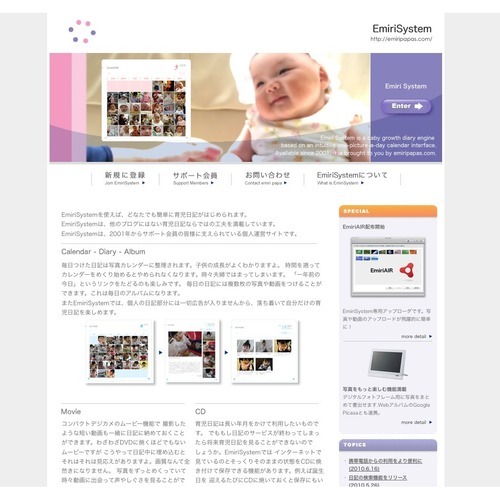 Developed by Tokyo-based tech start-up Crossfader[J]. There were too many awards presenting in each category of web services, we can’t cover them all in this single post. You can check all 544 entries through this link[J].